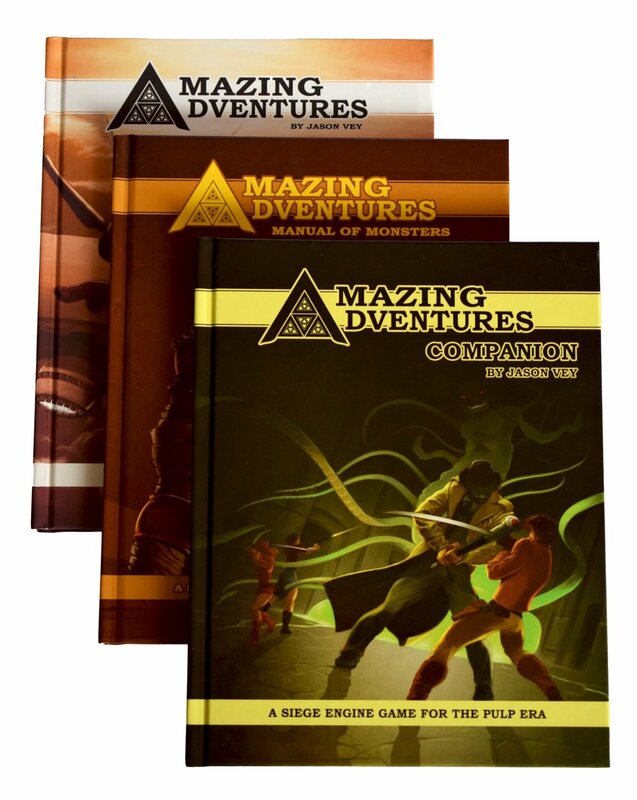 Product type: 3 Hardcover books and 1 adventure. This is a $107 value for only 89.99 (+ shipping and handling). "Pulp: Hard-boiled detectives, fedora-wearing action heroes, and steampunk gadgeteers rocketing to battle with their jet packs against bloodthirsty Thule cultists of the Third Reich." Welcome to two-fisted adventure with the SIEGE engine! Pulp SIEGE, the newest core game powered by Troll Lord Games' celebrated SIEGE engine, allows you to create any type of pulp adventure hero you want, and customize them as you like! Be it arcane scholars, mentalists, tomb-raiding archaeologists, Asian martial arts masters, or gangsters and G-Men, this game has you covered. And best of all, if you're a fan of Castles & Crusades, you can pick this game up and get playing in a matter of minutes!